He says he keeps it on him in case of an attack from wild animals. Last year, the Texas governor sent a coyote to canine heaven with a single shot while he was exercising in Austin, claiming it had threatened his dog. But if he were elected president, could Perry hypothetically continue to pack heat on his morning run? You're damn right he could. The Ticket asked several constitutional scholars and presidential experts if a sitting president would be allowed to carry a gun if he wanted to, even if it meant breaking local law. Since the White House is located in Washington, D.C.--a city that bans carrying firearms--the answer isn't perfectly simple. As presidential scholar Kenneth R. Mayer of the University of Wisconsin put it, the legal questions would get "big, fat, and hairy in a hurry." The short answer is that if the president really wanted to run around Lafayette Park with a revolver strapped to his leg, the legal barriers would be easily surmountable. In 2008, the Supreme Court struck down a decades-old D.C, law that banned gun ownership in the District of Columbia, but it is still illegal to carry a gun around the city. That second part doesn't sit well with Perry, who considers owning a gun a "fundamental right" enshrined in the Second Amendment to the Constitution. 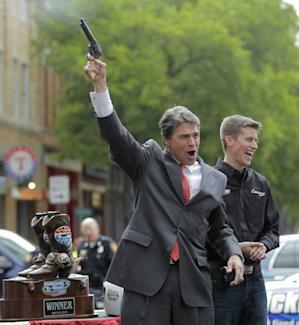 "We Texans like our guns," Perry writes in his book, Fed Up!. "We don't like meddlesome statists who want to infringe on our right to keep and bear them." Like it or not, the president would be breaking local law by carrying his gun in the city, but there are several ways he could get around it if he wanted to. First, the president could easily sign an executive order that makes it legal for him to carry a weapon. Executive Orders are considered as good as law, so there would be little that could stop him, said Adam Winkler, UCLA law professor and author of the new book Gunfight: The Battle over the Right to Bear Arms in America. "No man is above the law, not even the president. If applicable law bars him from carrying a gun, then he must obey," Winkler told The Ticket. "Of course, the president is powerful. He could probably just sign an executive order authorizing himself to carry guns wherever he likes." If, however, the president didn't want to pursue his right to carry through an executive order, he could also take the argument to the federal courts. The president could also request to be deputized in the District, which would allow him to carry a firearm via the same channels that members of law enforcement in the District use. The gun-toting president could, of course, avoid all these sticky legal problems if he kept his outdoor exercise regimen out of DC. There are plenty of trails, foothills and paths a short drive away in Virginia, a state with loose gun laws, where the president could run freely with the wind blowing through his holsters. The Secret Service, however, could make a very serious argument that the president shouldn't be carrying a weapon for his own protection. Remember, a spirited debate broke out in the days leading up to President Obama's inauguration over whether he would be forced to surrender his Blackberry for security concerns. (In the end, Obama got to keep his Blackberry, but under certain conditions.) If a Blackberry's almost off limits, you can imagine how the Secret Service might react if the president wanted to pack a Glock. When contacted for this article, a spokesman for the Secret Service declined to speak on the record. Of course, we won't really know how this would all come out until a president actually tries to pack heat on Washington's mean streets. Then again, we might not even get that far. When asked this week on the campaign trail if he was packing, Perry told Politico's Ben Smith, "I never comment on whether I'm carrying a handgun or not. That's why it's called concealed." And really, who would ever check?